Is that what it is called, “Fake news?” I’ve been wondering for all these years what the appropriate term was for mainstream news reporting. Whether CBS, ABC, NBC, CNN, Washington Post, New York Times, MSNBC, ecetra. There seems to be less hard investigating and reporting and more opinion journalism shaping news and public opinion than seeking the news. Even President Obama’s Daily News Press Conference seemed to be more of a collegial gathering of friends than news services’s asking tough questions to honestly report on news, policies and serve as an objective source of information to serve the greater public interest. I guess all those polls having Secretary Clinton winning the election handily fit the category of “fake news.” How can they get it so wrong unless they are reporting untruths or trying to depress the vote for the opposition? And doing opinion journalism instead of finding and reporting news, but yet representing it as news and not opinion? I never had heard of this term until the mainstream media outlets starting using it. It’s ironic that the Fake News labeling began with the progressive left mainstream media and they became the biggest proponents of it openly favoring Secretary Clinton. By backing and manufacturing stories to prop up their candidate, they became the drivers of fake news. 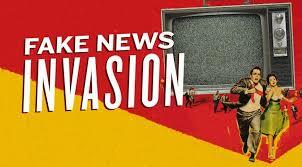 In socialist and communist countries fake news is known as propaganda. But we are a democracy, how can we have fake, propaganda news? Is this possible? Well, we now know it is. When the self proclaimed elite journalists of the mainstream mass media conspire along with Hollywood and late night TV news comedians (“Fake-Medians,”) to back the left and vote 90%+ for the democratic candidate year after year, you get … drum roll please … Fake News! Walla!!! We have Fake News!! !